Altough euclase is not well known by the public, it is very well known—and coveted—by mineral collectors. Rarely does it form in crystals which are large or which have enough clarity to be cut as gems. Euclase gets its name from its easy cleavage, euclase simply means “easily cleaved”. This is a problem for gem cutters who need to be careful of splitting an unfinished gem. 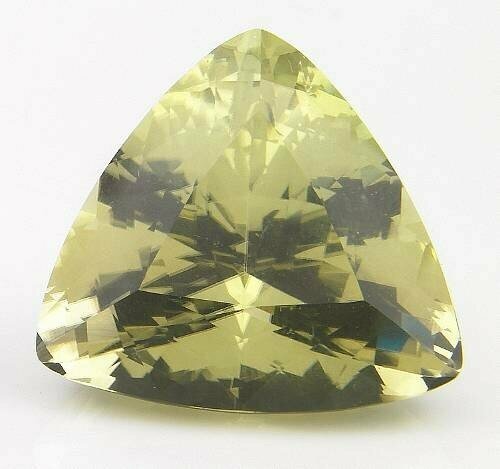 While a bluish green color in euclase is more typical and classic, the pleasant daffodil-yellow color of this triangular-shaped stone is very rare. That in addition to its exceptional clarity would make this stone an excellent choice for the serious collector of rarities.